Disclosure: I received one or more of the products or services mentioned for free in the hope that I would mention it on my blog. Regardless, I only recommend products or services I use personally and believe will be good for my readers. Oh my!!! 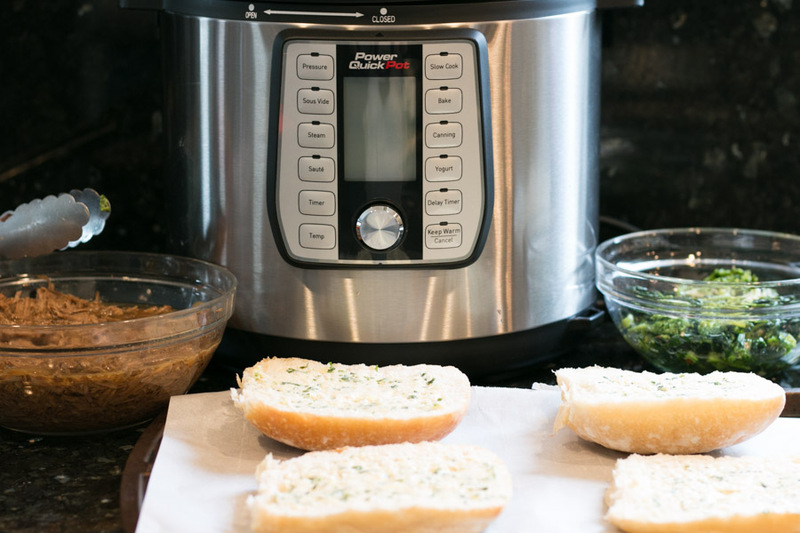 You guys I am so incredibly excited to share todays recipe with you for two reasons- #1 I used the NEW Power Quick Pot™ Pressure Cooker and its AMAZING! 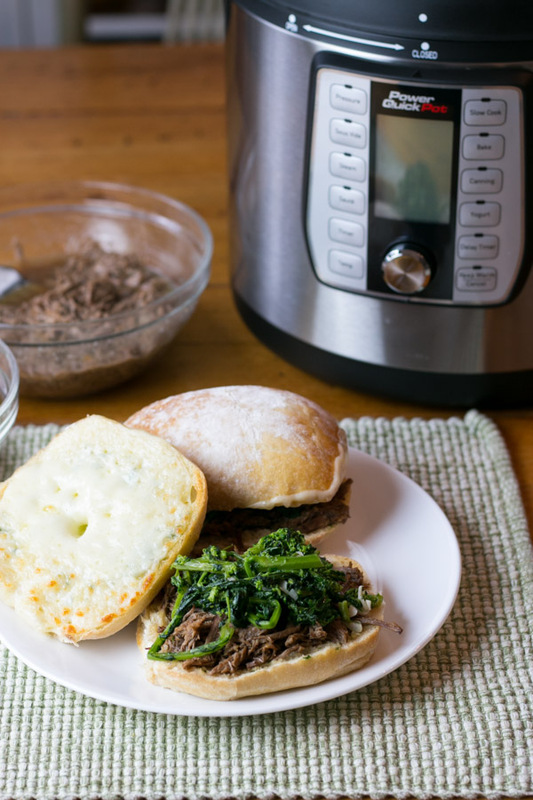 #2 This recipe for Power Quick Pot™ Italian Beef Dip Sandwich is ridiculously easy and DELICIOUS! 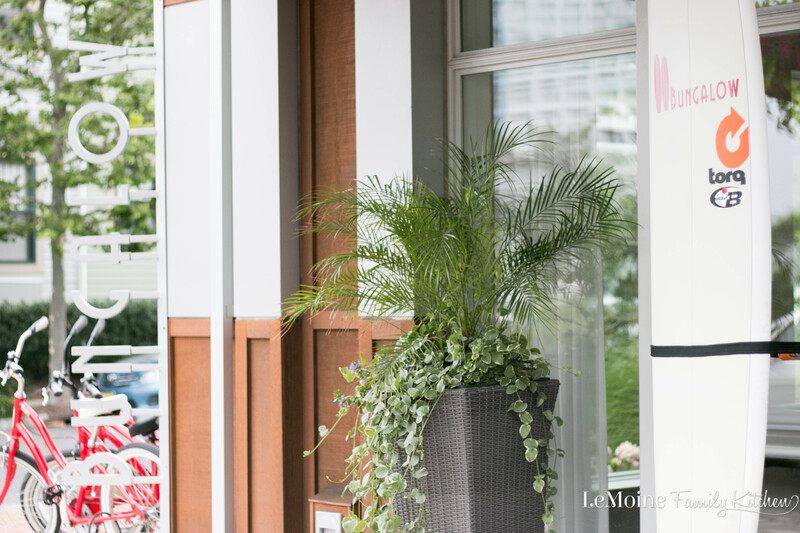 Lets start from the beginning… Several months ago I had the amazing opportunity to attend a live taping for the NEW Power Quick Pot™ Pressure Cooker! It was so much fun!! 4 celebrity chefs were there for a bit of a cooking competition with three rounds and all dishes had to be made in the Power Quick Pot™. The dishes that Ryan Scott, Jenny Behm, Rock Harper and Monti Carlo created absolutely blew my mind! I sat there really not knowing what to expect because lets be honest the idea that you could get an incredible flavorful, tender, nutritious meal in such a short amount of time made no sense to me. That was until I saw this Power Quick Pot™ in action- WOW! The chefs created an appetizer, main course and dessert each and my goodness was everything mouthwatering delicious! I was shocked and excited! Could you believe that fall apart short ribs could be cooked so perfectly in a short time? Me neither until I tasted them for myself. And dessert? Wow! I never would have thought that could one done in a pressure cooker! I was truly blown away with the capabilities of this pot and couldn’t wait to get to try it out for myself. This bad boy is not just a pressure cooker! Nope, you can also use it to sous vide, steam, sauce, slow cook, bake, can and make yogurt! What?!?! 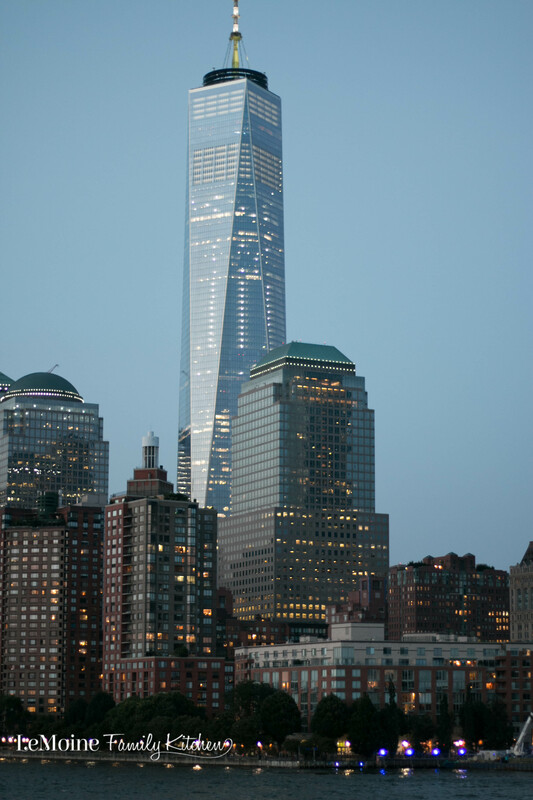 I know, amazing right?! There are 37 One Touch Features and heats up 50% faster then other brands. Now since I had never used a pressure cooker before I sat down with the instruction manual and got my learning on. I decided that for my first recipe I definitely wanted to use the pressure cooker setting- fast cooking, preserve nutrients and tender meat! 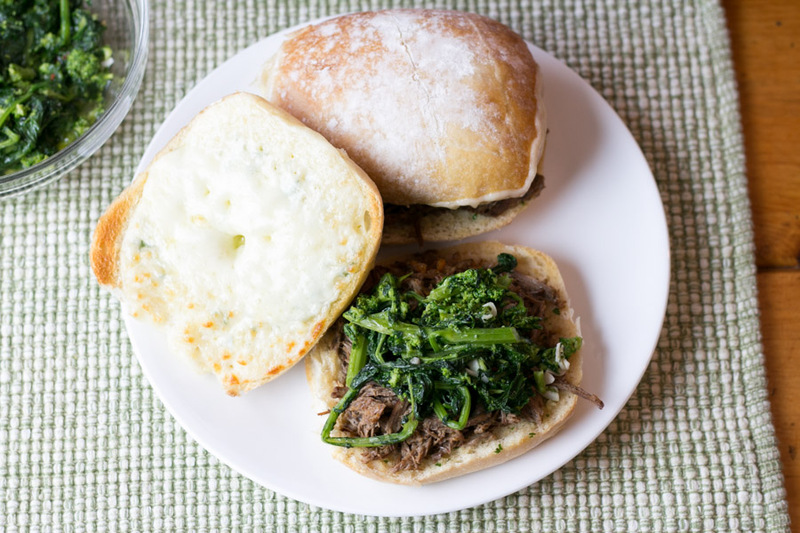 So came about my idea for this AMAZING Power Quick Pot™ Italian Beef Dip Sandwich! This pot is really easy to use. I simply placed some celery, carrots, onion, garlic, beef broth and a seasoned up london broil into the pot. Locked the lid in, hit pressure, selected beef and hit start. 30 minutes later I opened it up to check the doneness and it wasn’t quite falling apart yet so I simply set it for 10 additional minutes and WOW!!!! I couldn’t believe how the meat just fell apart! Now where does the “Italian” come in? Well I think my use of a lot of garlic and the beef alone has amazing flavor but one of my favorite hearty greens is broccoli rabe and it pairs perfectly with this beef!! If that wasn’t enough I slathered on some garlic parsley butter onto a ciabatta roll and threw in some provolone cheese to make my ultimate Italian style version of a French dip. You guys- AMAZING!!!! 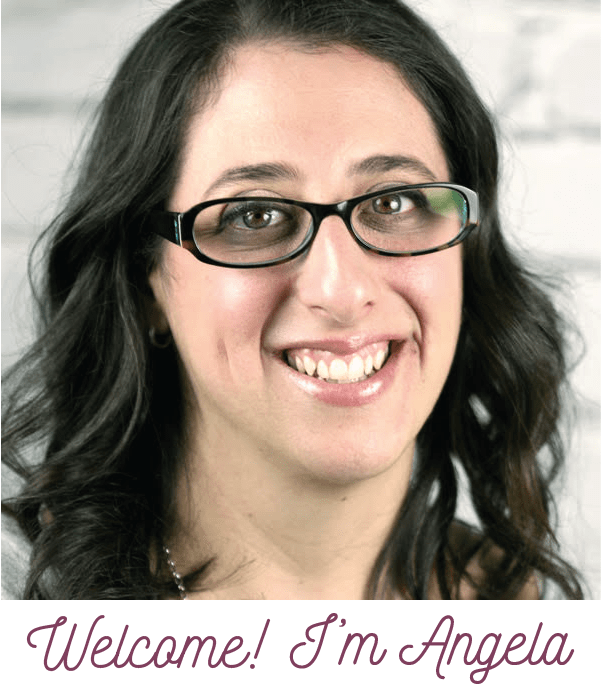 I absolutely LOVE broccoli rabe and its easy to make! Boil in salted water until tender, drain, then add a little olive oil to a pan to sauté garlic and red pepper flakes then toss in the broccoli rabe. The slightly bitter greens are such a great combo with that tender juicy meat and the sharp provolone. I know not everyone is a fan of broccoli rabe so another great option is sautéed spinach! 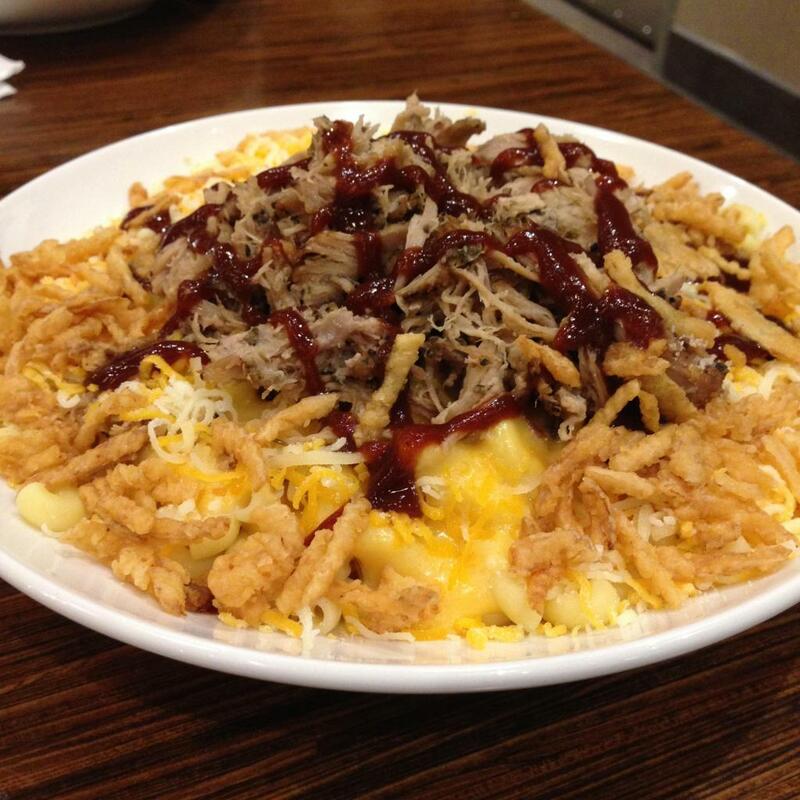 Are you drooling too? I cannot wait to make this one again! I have to say, I am so impressed with NEW Power Quick Pot™ Pressure Cooker and am looking forward to creating many amazing dishes! Oh and besides that this thing cooks up incredible food- its really easy to clean up as well! I am definitely hooked!!! You can get yours now too! They Quick Pot comes in 3 different sizes- 6, 8 and 10 quart. It also comes with 4 cookbooks – 1 from each of those incredibly talented chefs I mentioned earlier. Season the london broil on both sides generously with salt, pepper and garlic powder. 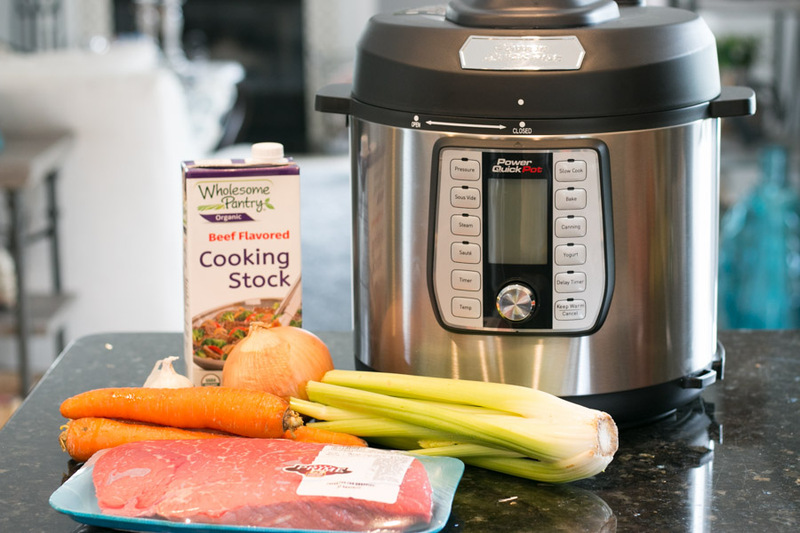 Place the carrots, celery, onion, garlic, broth and london broil in the Power Quick Pot. Set to pressure cook- beef. The default is 30 minutes. After the 30 minutes follow the instructions in the manual to release the pressure and check the meat. If it needs a little more time to fall apart, add 10 minutes. As the beef is cooking, boil the broccoli rabe in salted water until tender. Drain. In a sauté pan add a few drizzles of olive oil and the garlic clove. Cook until fragrant then toss with broccoli rabe. Remove the beef and shred with a fork or tongs. Pour a few ladles of the broth over the meat. It will reabsorb a lot of that delicious broth. For the garlic butter simply melt the butter, add in the garlic, parsley and a little salt. Slice open 4 ciabatta rolls and slater on some butter. 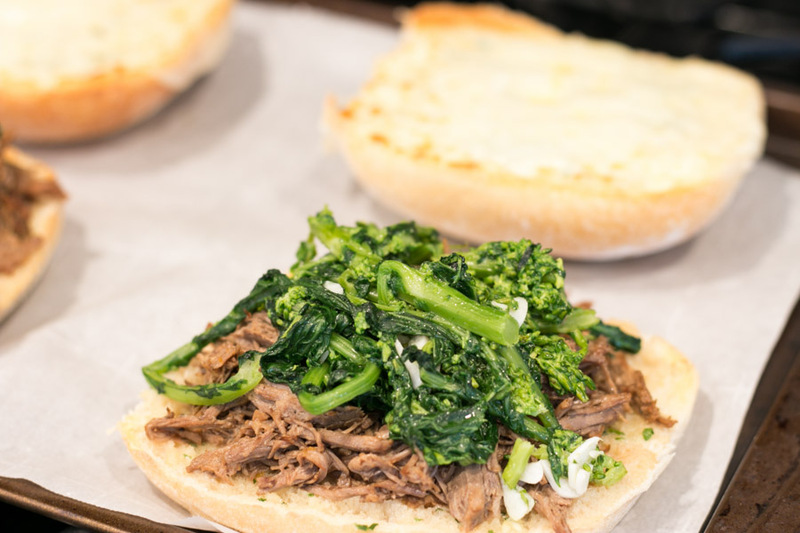 On the bottom piece of the roll add on the shredded beef and a mound of broccoli rabe. To the top of the bun add a couple slices of provolone. Pop under the broiler until the cheese is melted and lightly golden. Serve the sandwiches with a bowl of that extra broth because its perfect for dipping! Follow along to keep up with the latest updates, promotions and recipes for the NEW Power Quick Pot™ Pressure Cooker!!! I can’t wait to try this. Can you please do more recipes. I haven’t even unwrapped my power quick pot…. Thank you! I will certainly be working on more recipes using this Quick Pot… it is so easy to use and the food comes out great!